Meade 8" LX10 Telescope. Meade Instruments 2002 illustrated catalog pages 27 to 28 describing the Meade 8" LX-10 telescope. Copyright Meade Instruments, from Company Seven's Library. Download size is 4,916,838 bytes (in Acrobat Reader ".pdf" format). Meade 8" and 10" LX-200 GPS Telescopes. Meade Instruments 2002 illustrated catalog pages 32 to 35 describing the Meade 8" LX-200 GPS and the10" LX-200 GPS telescopes. Copyright Meade Instruments, from Company Seven's Library. Download size is 12,916,643 bytes (in Acrobat Reader ".pdf" format). Meade 12" LX-200 GPS Telescope. Meade Instruments 2002 illustrated catalog pages 38 to 43 describing the Meade 12" LX-200 GPS telescope. Copyright Meade Instruments, from Company Seven's Library. Download size is 23,233,826 bytes (in Acrobat Reader ".pdf" format). Meade 12" LX-200 SC Schmidt Camera. Meade Instruments 2002 illustrated catalog pages 50 to 53 describing the Meade 12" LX-200 SC f2.2 Schmidt Camera, a telescope designed for astrophotographic uses only. Copyright Meade Instruments, from Company Seven's Library. Download size is 35,598,345 bytes (in Acrobat Reader ".pdf" format). Meade 16" LX-200 GPS Telescope. Meade Instruments 2002 illustrated catalog pages 44 to 49 describing the Meade 16" LX-200 GPS telescope. Copyright Meade Instruments, from Company Seven's Library. Download size is 103,924,811 bytes (in Acrobat Reader ".pdf" format). Astrophoto Gallery on line directory of images of the Moon, Sun, Planets, Comets, and Deep Sky objects taken on film and by Meade Instruments CCD cameras. Copyrights retained by Meade Instruments and those who took these images, made available for personal use only. Instruction Manual: 8", 10", 12" Lightbridge Dobson Telescopes. The Lightbridge 12 is among those telescopes offered by Company Seven. Meade Instruments illustrated manual for their truss design Dobson style telescopes introduced in 2006, 21 pages. Revised December 2005. Copyright Meade Instruments, from Company Seven's Library. Download size is 791,000 bytes (in Acrobat Reader ".pdf" format). Meade Introduction: 7" Mak, 8", 10" and 12" SC LX Series Telescopes. Meade Instruments 2002 illustrated catalog pages 18 to 23. Copyright Meade Instruments, from Company Seven's Library. Download size is 20,131,239 bytes (in Acrobat Reader ".pdf" format). Meade Specifications: 8" LX90 SC, 7" Mak, 8" and 10" SC Telescopes. Meade Instruments 2002 illustrated catalog page 25. Meade specifications table describing the 8" LX90 Schmidt-Cassegrain, 7" Maksutov-Cassegrain, 8" and 10" Schmidt-Cassegrain Telescopes. Copyright Meade Instruments, from Company Seven's Library. Download size is 396,998 bytes (in Acrobat Reader ".pdf" format). Instruction Manual: 8", 10", 12" and 16" LX200GPS Schmidt-Cassegrain Telescopes, and 7" LX200GPS Maksutov-Cassegrain Telescope with Autostar II Hand Controller. Meade Instruments illustrated manual for LX-200GPS Models (discontinued in 2003), 69 pages. Revised July 2002. Copyright Meade Instruments, from Company Seven's Library. Download size is 1,418,578 bytes (in Acrobat Reader ".pdf" format). Instruction Manual: 8", 10", 12" and 16" LX200GPS Schmidt-Cassegrain Telescopes, and 7" LX200GPS-SMT Maksutov-Cassegrain Telescope with Autostar II Hand Controller. 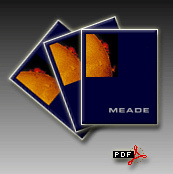 Meade Instruments illustrated manual for LX-200GPS-SMT Models (introduced in 2003), 73 pages. Revised October 2003. Copyright Meade Instruments, from Company Seven's Library. Download size is 1,581,627 bytes (in Acrobat Reader ".pdf" format). Meade LX200GPS Smart Drive Hand Control and Model 1220 Field De-Rotator. Meade Instruments 2002 illustrated catalog page 24. Illustrated description of the Hand Control provided with the LX200 GPS telescope and some Meade Apo Refractors as well. Also described is the optional Model 1220 Field De-Rotator for photographic or CCD imaging uses with Alt-Az mounted LX-200 Schmidt-Cassegrain telescopes. Copyright Meade Instruments, from Company Seven's Library. Download size is 2,928,397 bytes (in Acrobat Reader ".pdf" format). Meade LX200GPS Microfocuser Installation Tips. Additional help to clarify information about this accessory not already provided in the LX200 GPS telescope catalog. Copyright Meade Instruments, from Company Seven's Library. Download size is 16,117 bytes (in Acrobat Reader ".pdf" format). Meade Series 400 Nebular Filters. Meade Instruments 2002 illustrated catalog pages 108 to 109. Provides a good overview of Nebular filters, and how they work. Describes the Meade Broad Band, Narrow Band, and Oxygen III Filters. Copyright Meade Instruments, from Company Seven's Library. Download size is 751,247 bytes (in Acrobat Reader ".pdf" format). Meade Ultra High Transmission Coatings. Meade Instruments 2002 illustrated catalog pages 26 to 27 describing their coatings technology which has been designed to provide a good balance of Mirror reflectivity, lens transmission, environmental durability and long life. Copyright Meade Instruments, from Company Seven's Library. Download size is 1,278,477 bytes (in Acrobat Reader ".pdf" format). Meade 16" LX-200 GPS Telescope with Fork illustration with measurements describing the dimensions of the Meade 16" LX-200 telescope with Fork Mount and Pier. Very helpful for those considering construction of an Observatory. From Company Seven's Library. Download size is 30,265 bytes (in Acrobat Reader ".pdf" format). Meade 16" LX-200 GPS Drive Base illustration with measurements describing the dimensions and attachment bolt patterns of the Meade 16" LX-200 Fork Mount telescope Drive Base only. from Company Seven's Library. Download size is 250,475 bytes (in Acrobat Reader ".pdf" format). Meade Telescope Serial Command Protocol, Revision L, Oct 2002 This paper documents the Meade Telescope Serial Control Protocol utilized to remotely command and control Meade telescopes and includes a new series of commands proposed for the LX200GPS series. From Company Seven's Library. Download size is 141,696 bytes (in Acrobat Reader ".pdf" format). Meade Instruments DSI Camera & Autostar Suite Instructional Videos. This index page lists the Instructional Video series produced by Meade Instruments for the DSI Camera with Autostar software suite. Each video requires Microsoft Corp. "Media Player".